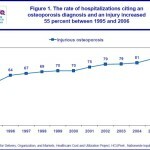 In 2006, injuries were recorded in 1/4 of all hospital patients with an osteoporosis diagnosis. Pathological fractures (i.e. spontaneous and stress fractures), hip fractures, and fractures of the ribs, vertebrae and pelvis were the most frequently occuring injuries among these patients.